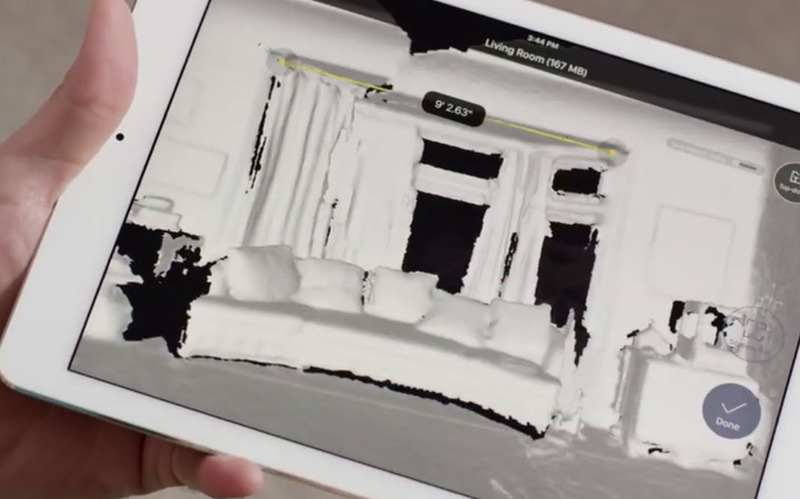 Measuring your home just got a lot easier and a lot cooler thanks to a crazy dense geometry scanner and an iPad app. Canvas from Occipital is pretty powerful new tool for home improvement, or really anything exercise that requires sizing up your pad. 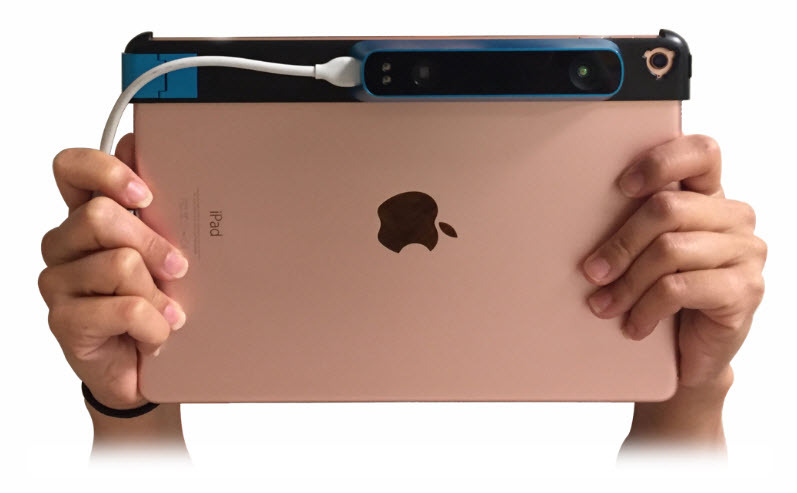 By using the world’s first mobile depth sensor, Structure Sensor, and some imaging algorithms in the background, users can walk around a room, point their iPad at everything, and then get a scale-accurate digital 3D model of the space rendered in almost no time at all. After the digital model is generated, users can pop into their iPad and view any space at any time, drawing custom lines between any two points to view exact distances. For $29.00 per scanned room there is also an optional scan to CAD service which converts the scanned image into a properly layered CAD file; the service supports skp, .dwg, and .dae files. Although the CAD files take 48 hours to generate/process, it’s still significantly cheaper than using specialized equipment for measurements, or developing the imagery by hand. Canvas is compatible with the iPad Pro 9.7″, iPad Pro 12.9″, iPad Air 2, iPad Air, and iPad Mini 4. When used with the original iPad Air however, there are a few limitations: the lower built-in memory makes it harder to scan large spaces, and it cannot be used with the wide vision lens add-on that enables enhanced tracking. In addition to capturing quality day time images, there are two infrared lights built into the sensor that enable users to perform imaging tasks in the dark. The more technical users also have the option to change the programming of the LEDs by using the product’s SDK. The Structure Sensor is 119.2mm x 27.9mm x 29mm. It weighs 95 grams, has a VGA resolution of (640×480) and a battery life of 3-4 hours of active sensing, or 1,000 hours on standby. The mobile optimized range is designed to work at a minimum of 40 centimeters and expands to over 3.5 meters. Fetch: A virtual pet to play fetch with in the physical world around you. Ball Physics: An augmented reality demo where virtual balls interact with the geometry of the surrounding space. Object Scanner: A feature for generating digital 3D models of general objects and export them for 3D printing or as CAD files. Although the Canvas app is free, the Structure Sensor costs between $379.00 – $499.00, and accessories start at $49.00. The project originally launched on Kickstarter back in the fall of 2013 and raised over $1.2 million from over 3,500 backers. To date Occipital has raised over $20 million in three rounds of funding with investors including Intel Capital, Foundry Group, Draper Frontier, and Shea Ventures. Great write up! I think something like this CAD app would be a perfect supplement to any job site. Awesome app, I just wish it had compatibility for Android. Getting a good design concept down comes to everything matching up just right. When you are dealing with an older home, sometimes the rooms are not square and things like that. This makes the job much faster. Very cool use of the available technology. For the designers out there, the price point is not that bad at all. Not compatible with Android sort of limits the use, but maybe that is coming soon. It would make one of the most primitive actions a little easier and more efficient for builders and designers. Assuming the scanning technology is accurate of course.